I was quite excited as I walked across the farmyard seeking permission from the owner, Louis Dowley, to visit Tybroughney cross pillar. The pillar is located in an overgrown graveyard situated on the farm. Standing out among the farm buildings was a restored 15th century tower house. Mister Dowley asked me would I like to see inside. WOW! what a bonus. 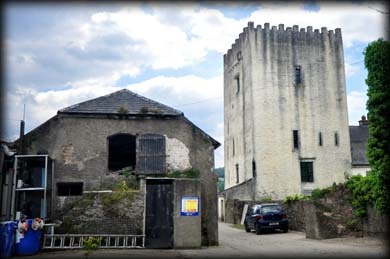 The castle, which may stand on the site of an earlier castle, has been sympathetically restored by the owner over a long period. It was an absolute joy to wander around the interior of the building. 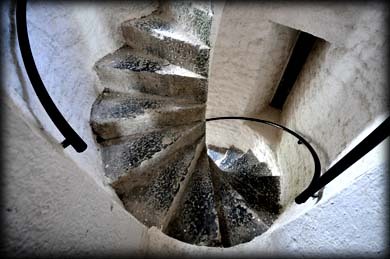 The spiral staircase, that leads to the upper floors, was much brighter than most of the castles I have viewed. This was thanks to the light reflecting from the bright lime plastered walls. 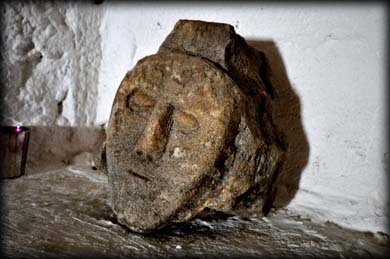 The stone head, pictured below, was found on the grounds of the farm. The castle was probably in the possession of Richard Butler, 3rd Viscount of Mountgarret (1578-1651). He was outlawed by Cromwell in 1652, a year after his death for his part in the Catholic Confederacy. His son Edmund, 4th Viscount of Mountgarret, was pardoned by King Charles II and restored to his estates. The castle stands on the border between Kilkenny and Tipperary and the ramparts offer superb views of the surrounding countryside. 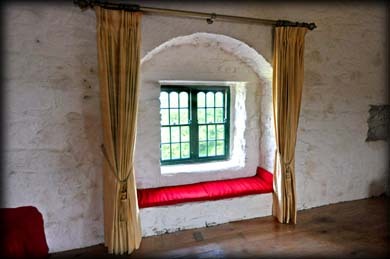 Situated: From Carrick-on-Suir head east on the N24 for about 2.6 kilometres. Then turn right for Tybroughney. The castle is 2 kilometres down here on your right. Discovery Map 75: S 4397 2164. Last Visit: June 2015.